Have you ever wanted to offer buying options in addition to Amazon? What held you back? Not wanting to litter your website, YouTube description or tweet with multiple buy buttons or links to the same product? Maybe you didn’t have the space, or time, for adding more than one link? Does 100% of your audience shop exclusively at Amazon? The answer is most likely “no”. Shopping from your preferred store will always trump your desire for your favorite influencers to cleanly monetize your purchase. While intelligent links have helped marketers become more profitable than ever (by boosting their conversions with localization) we are seeing another major evolution in linking technology and are really excited about what it means. Your audience wants to buy from their preferred store(s). You want to track and monetize this transaction. So why are you deciding where to send everyone? 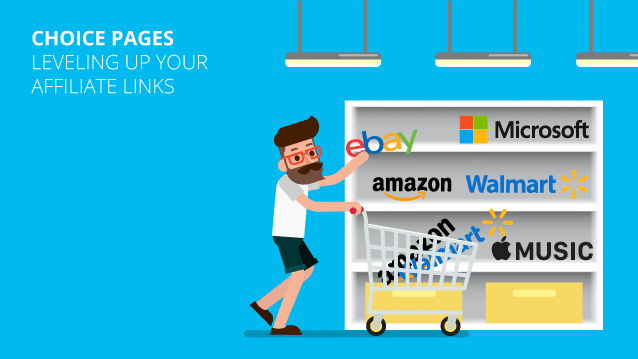 We are all too familiar with opening another tab to search for a product in the store you actually want to buy from. Why not save your audience the work, increase conversions and diversify your revenue all at the same time? Let me introduce Choice Pages. They allow you to build a customized, no-code, landing page, complete with art and multiple buy buttons, in minutes. Best part- you can edit or update it just as easily. Choice Pages are lightweight, mobile optimized, landing pages that are typically focused on a single product (digital or physical) with some prominent art or product photo followed by one or many store-specific buy buttons. I dive deep into a number of use cases in a subsequent post but to kick things off, here are a few examples to make sure we are on the same page. In the era of more intelligent links, that can be fully customized based on geography, device, language and date of a click, why would you need a Choice Page? Doesn’t adding extra clicks in the buying process reduce the conversion rates? Great questions and the answer is a bit nuanced. A well built intelligent link, or one with automatic localization, can be a significant help to a marketer and solve a lot of problems but unfortunately doesn’t solve all of them. In these cases (see below) the two tools – intelligent links and Choice Pages – combined together give a scrappy marketer a complete toolkit. The gist is that Choice Pages provide value outside of an intelligent link in two main ways – with compliance-related challenges and when selecting the perfect destination for a click requires more than some logic to work out. A major value-add that Choice Pages provide marketers is in the name – choice. As the music industry has become clearly aware, consumers have a growing number of options in how they consume music and sending everyone to Spotify isn’t the best choice. The book industry is quickly seeing this too and brand marketers are also jumping on the bandwagon in providing their audience a carefully curated listed of the best options to consume the products they are promoting. While Amazon.com has done an amazing job at leading the e-commerce charge in the US, best guess analysis puts them close to 50% market share, which still means that 1 out of every 2 online purchases is NOT on Amazon. Further, other major retailers are stepping up their game to claw back market share (eg. Walmart is beating Amazon at its own game and Amazon Competitors Capitalize On Prime Day as a couple of recent examples). Outside of the US, Amazon’s market share is significantly smaller and a bigger fraction of sales are made outside of the Amazon ecosystem. In Germany, Amazon has 28.7% market share, with approximately 1 in 4 purchases (source). In Canada, Amazon sits closer to 20%, approximately 1 in 5 (source) and in the UK the number is even lower, about 16%, or about 1 in 6 (source). Geniuslink has been the go-to tool for helping marketers capitalize on their middle and long tail visitors by allowing them to provide a better user experience and monetize their international visitors. Now we are doing this again by helping our clients increase their conversion rates by optimizing for sales outside of any single e-commerce ecosystem. Providing a short list of top retailers that sell a specific product will help marketers start capitalizing on that percentage of sales that don’t happen on Amazon. While Amazon appears to have the largest affiliate program, with claims of close to a million publishers, it doesn’t pay out the highest commissions. In fact, after the major shakeup and removal of Amazon’s tiered commissioning structure in early 2017, many publishers found that the rates paid out by Amazon, even for some of the top categories, is now paltry in comparison. For example, Amazon pays out 1% for video games and gaming consoles (source) while the Microsoft Store Affiliate Program pays out double that – 2% (source) and you can earn between 3X to 6X Amazon’s rate with Game Stop’s affiliate program (source – requires login). For affiliate marketers, it’s all about maximizing your earnings per click (EPC) and this can be done in one of two ways – increasing your conversion rate, the number of clicks that turn into purchases or increase the amount you are paid per click. A Choice Page provides you with the options to improve your EPC with both options – by providing shoppers with a retail option that is best for them (higher conversions) AND providing retail options that may pay out more (higher commission rates). And the best part is that you don’t have to abandon the Amazon link you started with. Just like getting kicked out of the Amazon Associates program, it’s almost a rite of passage to learn the hard way that an over-reliance on a single affiliate program is a recipe for disaster or at least major heartache. Whether it’s a major policy change (like 2017’s change in Amazon’s commission structure) or a simple mistake on your part that violates a terms of service (10 simple mistakes that get you kicked out of Amazon’s affiliate program), being reliant on a single affiliate program can wipe out most, or all, of your revenue in a matter of moments. Don’t let that happen! Trust us here, we have learned this lesson the hard way a few times now! In early 2014 we lost nearly 80% of our recurring revenue in one month with the iTunes / App Store affiliate program being consolidated from multiple affiliate networks and programs into a single one. Unfortunately, it took us longer than most to learn this lesson, and we faced multiple near catastrophic events over years with Amazon’s evolving policies (don’t worry, Geniuslink is doing great, we aren’t going anywhere and continue to be fully compliant!). The big lesson for us, that we hope you can learn for, is that just like how you should diversify your stock and investing portfolio, having some diversity in your revenue from affiliate programs is also a wise choice. Choice Pages make this process much easier. As a marketer, you face a growing number of compliance challenges, especially when using affiliate programs, and the stakes keep getting higher. Getting kicked out of the Amazon Associates program can cost you a few months of hard earned revenue! With a recent report stating that 90% of the links on YouTube and Pinterest not being disclosed, it’s become a high priority for Amazon’s Associates program to crack down to avoid the wrath of the FTC. A growing number of YouTubers are getting the email of doom from Amazon for not correctly disclosing their link’s destination or including an affiliate disclaimer when posting in social media. 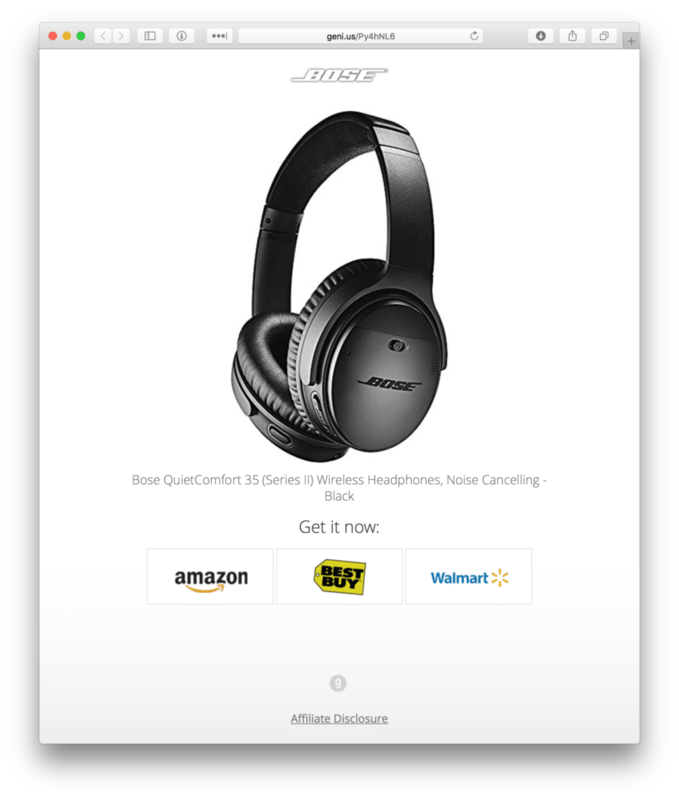 Using a Choice Page immediately removes these two issues by including both an affiliate disclosure and a clear indication of a link going to Amazon. It also reduces any possible buyer confusion of the destination. Another of the rarely understood nuances of Amazon’s affiliate program is in section five of their Operating Agreements Policies where it states they don’t allow “offline” placements of affiliate links, such as in emails, PDFs or eBooks. Again, this offense has caused a growing number of marketers grief as they find their top converting channel is in violation of Amazon’s policies. Use of a Choice Page, instead of an affiliate link, in the email, PDF or eBook allows the user to be sent to a web page, which is completely above board. 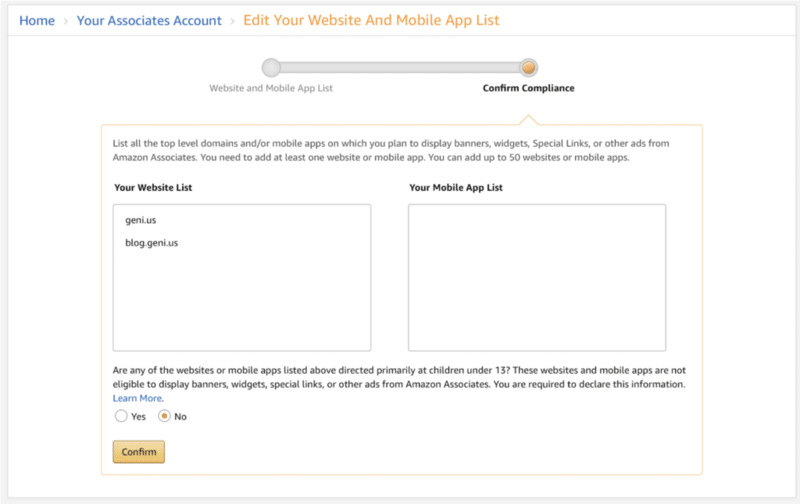 Two quick things to note here are that you can build a Choice Page with a single destination (Amazon) and that you should disclose “geni.us” as one of your websites in your Amazon Associates Central dashboard. Using Choice Pages for Promoting Music – Do you send fans to buy, stream or watch? A Choice Page lets your fans decide what works best for them. Learn more. Using Choice Pages for Promoting Books – eBook or hardcover? Print or audio? Readers “read” in lots of different ways and now you can give them the options that work best for them. Learn more. Using Choice Pages for Promoting Products – Dividing ad spend between multiple retailers or host a landing pages with multiple buy buttons leads lots of marketers to crummy conversion rates. Choice Pages work great for brand marketers who care about the user buying experience and their conversion rates. Learn more. Marketing via Email with a Choice Page – Email newsletters can be incredibly powerful for promoting products but violate Amazon’s operating agreement for their affiliate program. A link to a Choice Page doesn’t break the rules and also helps keep you in compliance. Learn more. Using Multiple Affiliate Programs with a Single Choice Page – The trouble with too many eggs in a single basket applies to affiliate marketing as well. Choice Pages let you diversify your revenue while helping increase conversions and bottom line. Learn more. Before looking forward let’s take a quick look back. Earlier this year we rolled out a new pricing model where we took the Choice Pages feature from a $99 / month plan and made them universally available at our $2 / month plan. Making sure that anyone could use them was a big first step for us. UI redesign to make things more accessible and intuitive. Our next engineering push (expected completion in August 2018) includes a new page theme that’s better for promoting products, the ability to add custom button art and images, as well as better metadata handling for iTunes products. While we have big plans on the horizon, I’d still encourage you to dive in and start playing around with Choice Pages today. We’d love to learn how you build and utilize them. From there, once we have the UI nailed, we’ll launch some features we’ve been scheming on to significantly simplify monetization from using these Choice Pages. We’ll build, you let us know what you think and we’ll build some more. Rinse and repeat! If you couldn’t tell, I’m really excited about the opportunities that Choice Pages open up and am excited to work with you, our awesome clients, to take full potential of these new tools. As always, please don’t hesitate to reach out with any questions/ comments/feedback and be sure to let us know when you build your first Choice Page – we are excited to check it out.